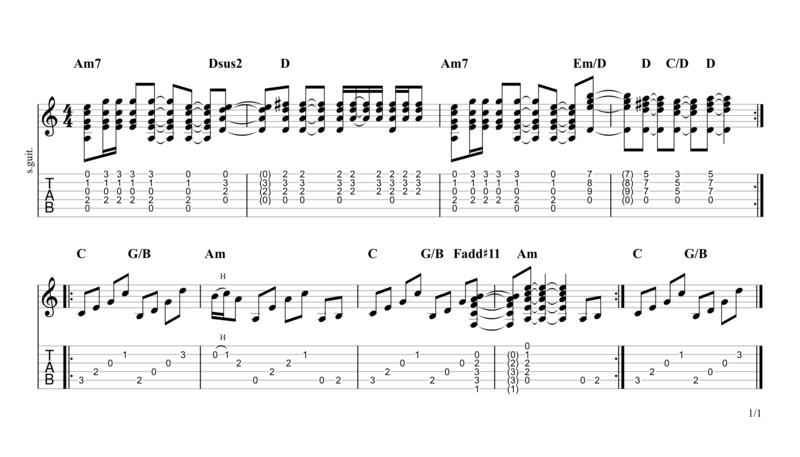 Scroll down for full video lesson (with tab) of Stairway To Heaven by Led Zeppelin. Stairway To Heaven was written in 1971 by English band Led Zeppelin and appears on their fourth studio album 'Led Zeppelin IV'. It is without a doubt one of the greatest rock songs ever recorded and continues to inspire generation after generation of new musicians. At 8.02 minutes in length it is packed full of twists and turns and is made up of many different sections. The song isn't for the faint-hearted and certainly does require some work if you want to play it like the original. 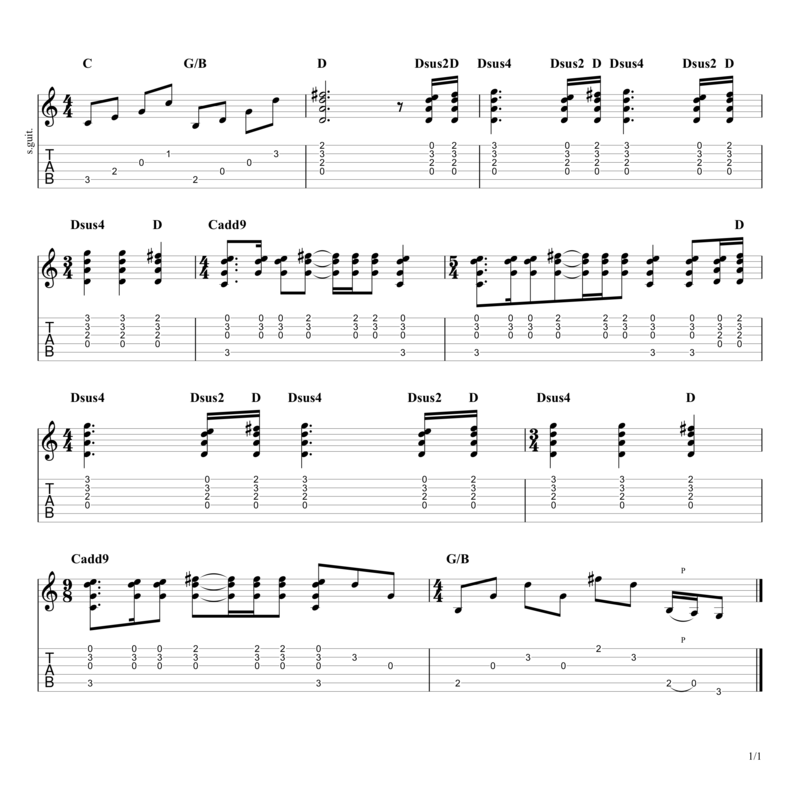 As this website is all about fingerpicking we'll cover everything other than Jimmy Page's epic guitar solo. The song itself isn't all that hard to play, it's all in the key of A minor and the chords aren't all that difficult - so long as you're ok with some mini barre-chords. 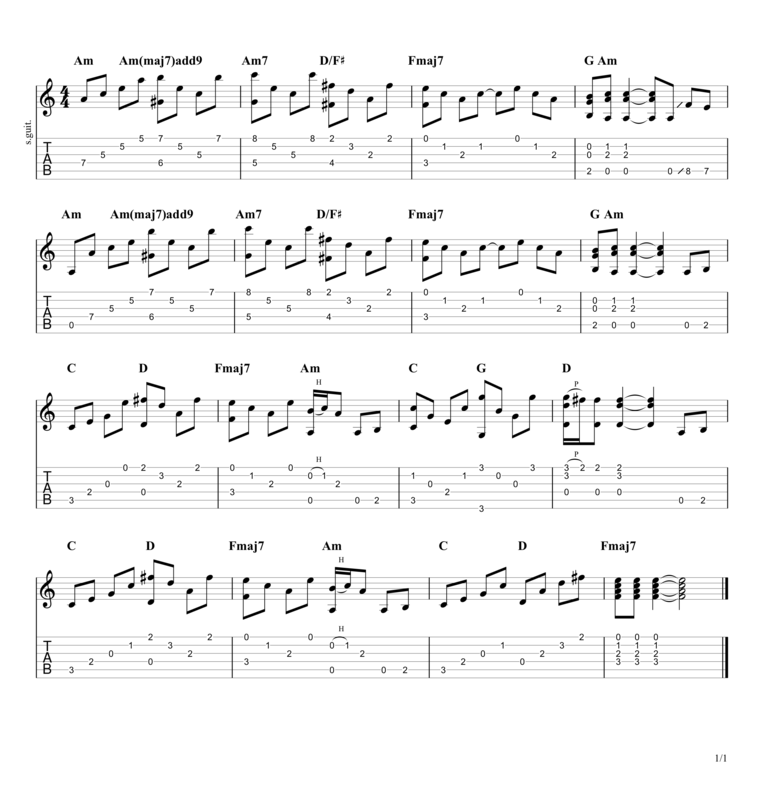 The real challenge is memorising the whole thing; there are lots of different arpeggiated chords and plenty of small nuances all over the place. Stairway To Heaven is no. 25 on my Top 60 Fingerpicking Songs of ALL TIME list. If you've not seen the list be sure to check it out and sign up to my weekly email lesson so you don't miss learning any of these great fingerstyle songs. 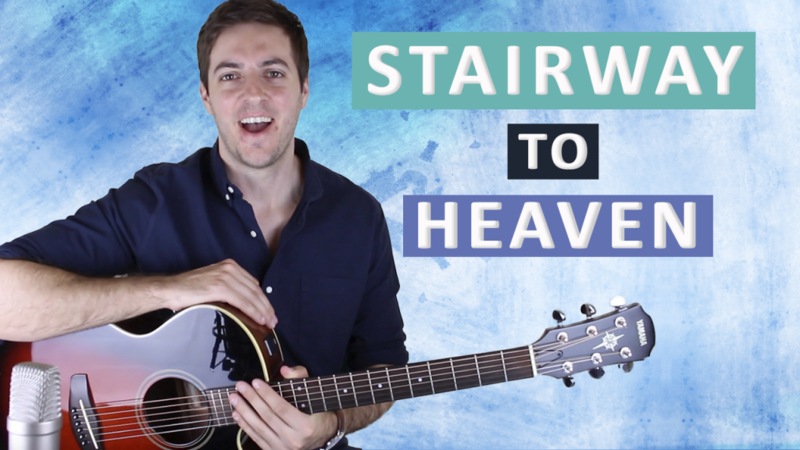 The intro to Stairway To Heaven is one of the most famous guitar parts ever written. Everybody, regardless of whether they've heard the entire song or not, knows this section. As I said, it's not too complicated in terms of the chords but you must try very hard to let each and every note ring into the next. One sure way to kill all the emotion of the song is to play these notes staccato. Just before moving into the next section we get the same chords but this time played mostly as 16th notes. 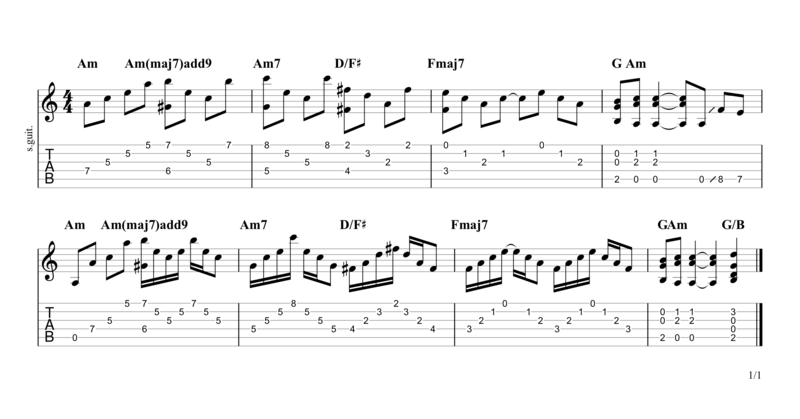 This is one of the harder parts of the song and will likely require a lot of repetition and practise to get it up to speed. Here the song gradually speed up and moves to strumming. Watch out for the rhythm of the chords as it's very easy to get the timing wrong. You may also want to play this part with a pick, either way it doesn't matter. This is a difficult/clever section of the song mostly because of the use of odd time signatures; they certainly didn't have to put in a bar of 5/4 or 9/8 but they did and it works great! Try hard to get this down with the song to make sure your timing is bang on! Led Zeppelin were formed in London in 1968 and consisted of lead singer Robert Plant, guitarist Jimmy Page, bassist/keyboardist John Paul Jones and drummer John Bonham. Throughout the 70's the band gained major success across the globe and between the years of 1971-1975 were largely considered to be the biggest band in the world. Heavily influenced by early blues musicians such as Muddy Watters and Howling Wolf, their music was a blend of hard blues, rock, folk and psychedelia. The band decided to part ways after the tragic death of John Bonham in 1980, and have only performed together a small handful of times since. Most notably in December 2007 when they played London's O2 Arena with Bonham's son, Jason Bonham, bravely taking his father's place behind the drums. The question everybody's wondering is if they'll ever do it again? If you want to make sure that you're really on the right track with fingerpicking then perhaps try one of my fingerstyle guitar courses find out more here.